The pine tree symbol, with the tagline “The New Spirit”, represented the Armory Show’s radical mission to present the most advanced contemporary art of its day. The A.A.P.S. was media savvy and the ubiquitous logo played a key role in promoting the show. Instantly recognizable, the logo even gained popular currency; in 1913 Wanamaker’s department store ran advertisements with the Armory Symbol to suggest the modernity of their merchandise. The use of the pine tree as an American symbol dates back to the 17th century, originating with the 1629 seal of the Massachusetts Bay Colony. It was also featured on the famous “pine tree shilling”, the first currency minted in the American colonies, which was coined in Massachusetts in 1652. 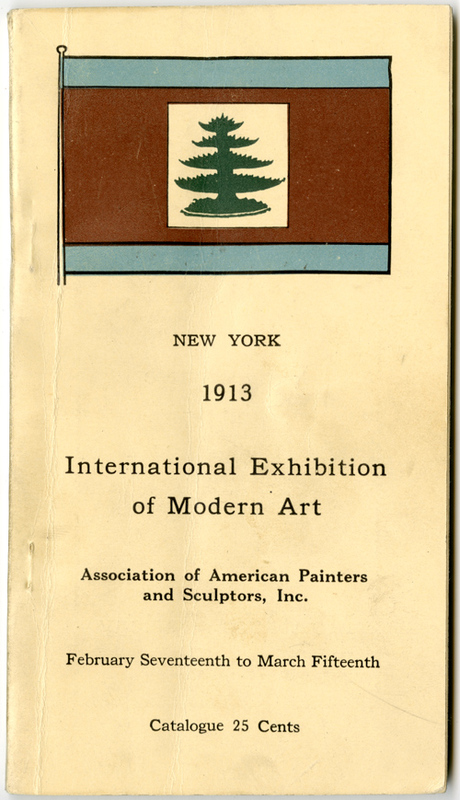 Kuhn recognized the historic associations of the pine tree flag and gave the symbol new meaning in relation to the Armory Show. Though European Modernism arguably stole the show, the pine tree symbol linked “The New Spirit” of aesthetic innovation to the history of American political rebellion.